I am slightly peeved that I'll have to go out to the store to purchase the John Derian for Target home décor, now that the preview sale has passed without me actually being able to complete any purchases. Hellooooo, silhouette coasters and phrenology-head serving tray, you shall be mine. I'm going to console myself with a newly-coined drink: The Phrenology. Come over: I'll make you one, and then make invalid scientific claims about your skull shape. Ed: goddammit, Target, why have you sucked so badly at making these two things purchase-able? I have been to six (!) Target stores since Sunday morning, battling my way through a hangover at 9 a.m. on the ostensible release date, and yet NONE of this is on the floor in any stores in Chicago. Helpful stock-girls have indicated that it's all back in the stockroom, but is "not available for purchase" at this time. PAH. 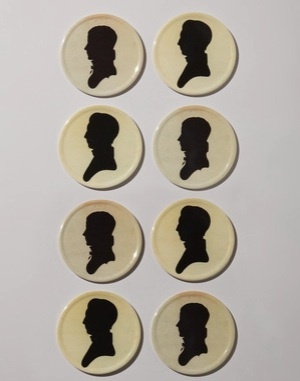 Also, the fact that the silhouette coasters remain absent from the website makes me antsy. 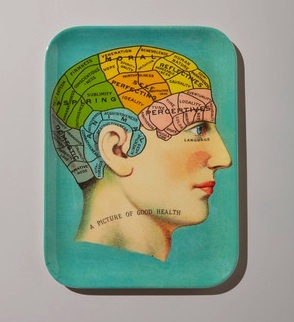 There was some of it still on Gilt when I checked, but the phrenology tray was gone. I was hoping you had gotten one!